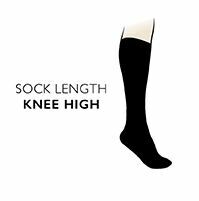 Proper ski socks have a lot of demands placed on them; warmth, protection, performance… Falke has designed their Ski Socks to meet all those requirements and more. The natural wool and synthetic yarn blend is loop cushioned to a medium volume, offering a superb balance of warmth and comfort. Anatomically positioned padding, with left and right-specific fit, protects and reduces pressure on the toes, shin and calf, achilles tendon, ankle and heel with shock-absorbing cushioning. Other specially woven areas include an 'anti-wrinkle' ankle and are thinner, for flexibility, using air channels to transport moisture to the outside, aiding cooling and minimising bacteria production.